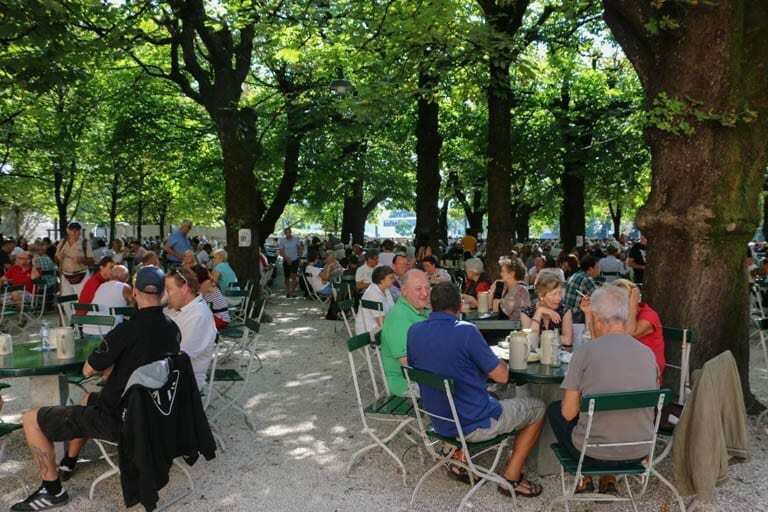 My first mission was to find the largest beer garden in Austria, located at the foot of Monchsberg (Monk’s Hill) in a former monastery where they started brewing beer in the abbey as early as 1621. The Augustiner Bräu is no longer a working monastery, but the monks’ original brew recipe is honored to this day, as well as the tradition of pouring the beer into large, stone jugs tapped fresh from wooden barrels. While I made it to the brewery without getting lost, I took a wrong turn once on the estate and ended up in the kitchen rather than the beer garden. 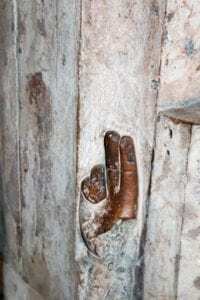 I was hustled out by a kind but harried cook, who showed me a dark and low-ceilinged hallway that allowed for a glimpse of the old abbey itself and opened up into the sunny courtyard filled with toasts and laughter. 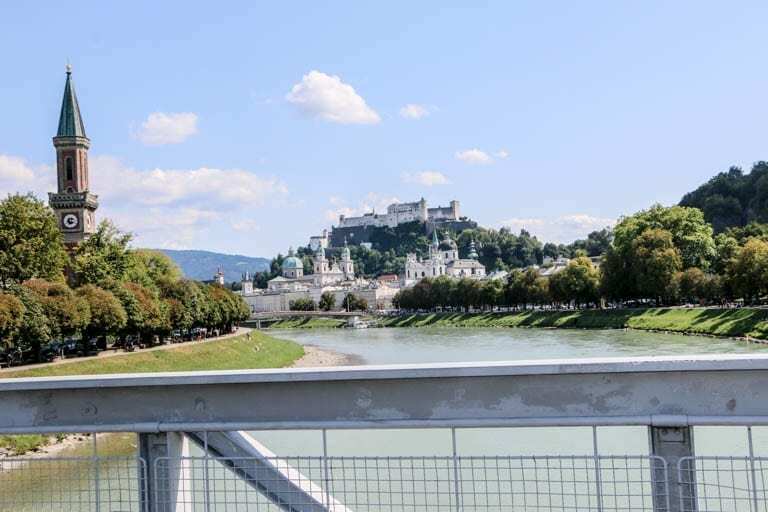 Once fortified by a liter of cold, secret-recipe beer, I set out on a path that wound up toward the Hohensalzburg Fortress and Nonnberg Abbey, the convent featured in the Sound of Music. I was entirely distracted by the views of the Berchtesgaden Alps. I sat down on a bench and mountain gazed for so long that I had to rework my plan to visit the fortress that evening because the hills literally came alive with the sound of music from the open-air “concert” screening that I was missing. 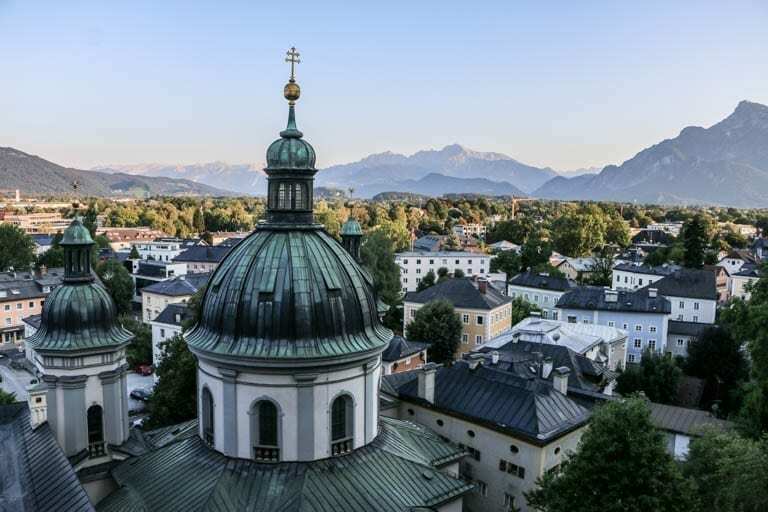 Every July and August, the Salzburg becomes a citywide stage, with concerts, opera and plays all day and all night. In the evening, the highlights are played on a large screen in Kapitelplatz (Chapter Square) beneath the cathedral. On short notice and with just 26 hours to explore Salzburg, this was the best I could manage in terms of seeing an event. That is until I bumped into an off-duty Salzburg tour guide after the show. I was feeling pretty good about my day of exploring and was gloating a bit over a glass of Austrian white wine at one of those long, wooden tables that are so common in German-speaking countries, and so conducive to sharing, when Robert told me that I hadn’t seen anything yet. Robert took me on a walking tour, showing me Mozart’s birthplace, the beautiful church that Napoleon used as a horse stable, the fingers sculpted into the side of a church to cement a gesture of promise that it is the only church of this design, and Judengasse, once the center of Jewish life in Salzburg before the second pogrom ended in the expulsion of the Jews in 1404. Without my personalized tour, I never would have noticed the statue of Archangel Michael (known as an advocate for the Jews) perched high above the street, peering protectively down on passersby. 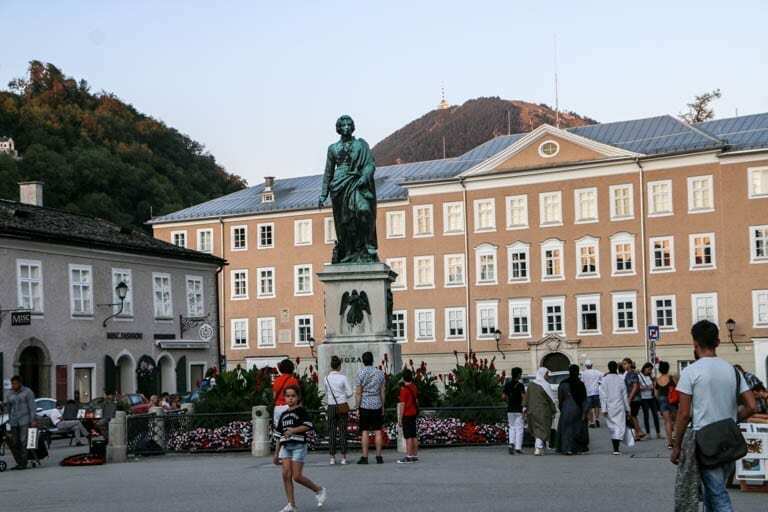 In Mozartplatz, where a statue of Mozart dominates the center of the square, for the second time that day, Salzburg lived up to his reputation as the home to the sound of music. The beautiful and haunting sounds of the play Jedermann (Everyman) caught my ear, and I wandered toward the sound. Robert showed me how I could catch a glimpse of the stage from the square. 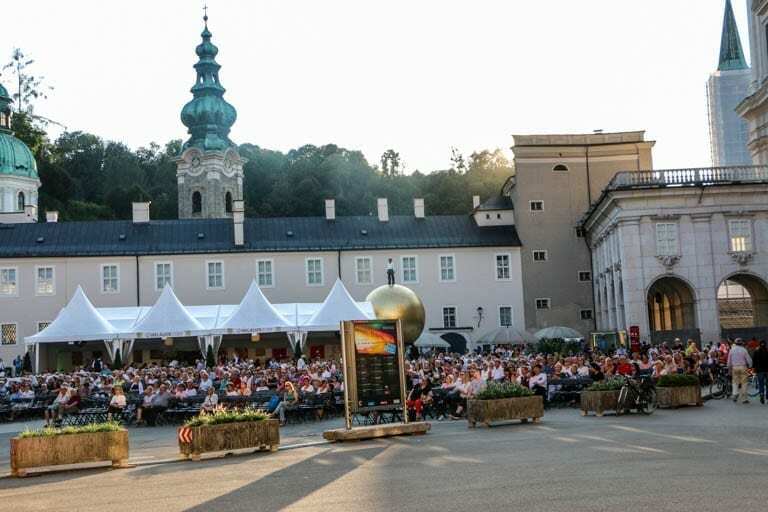 He explained that the play was performed to launch the festival in 1920, just after WWI, and has anchored the festival ever since, except during the time Austria was annexed to Germany during WWII (the Nazis banned the play because the original director and music composer were Jewish). When I got home, I looked up the play and this is what the Salzburg website wrote about its anchor play: At its core, Jedermann poses this question: What happens when death enters our lives? Given the purpose for my extended trip in Europe, there is little wonder that the music drew me in. The next day, I had a couple of hours before my train back to Vienna, and I needed to see that fortress. 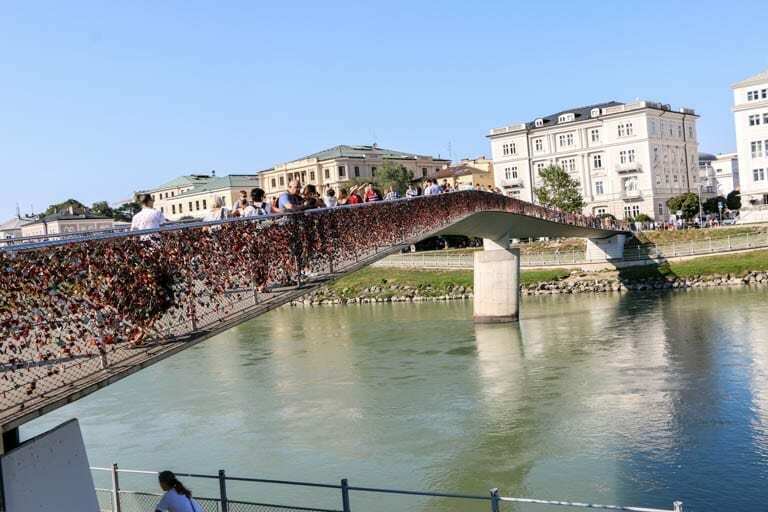 I set out for the hill, skipping the beautiful bridge full of love locks in favor of walking along the river. Along the way, I noticed a little stairway. For kicks, I took the steps and found myself in a beautiful cobble-stoned lane. 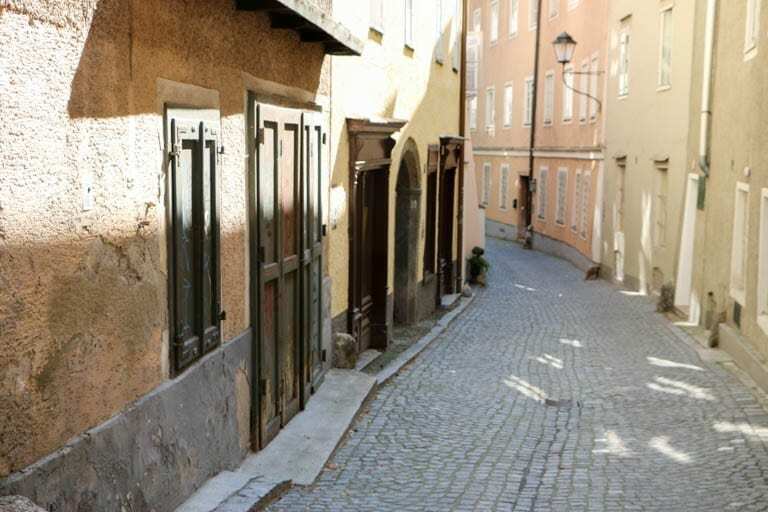 A quick check on my search-engine told me that I’d found Steingasse, a former main street during medieval times. 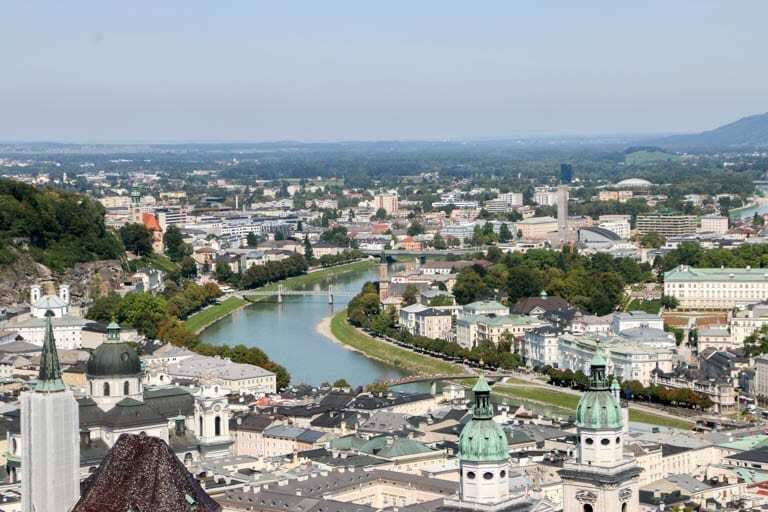 I stayed on Steingasse for as long as possible before turning back to the river and heading over a bridge toward my fortress – my Salzburg compass. The quiet walk to the top was worth it for the views and, once again, I took part in my favorite Salzburg pastime. I just sat on a bench and mountain gazed. 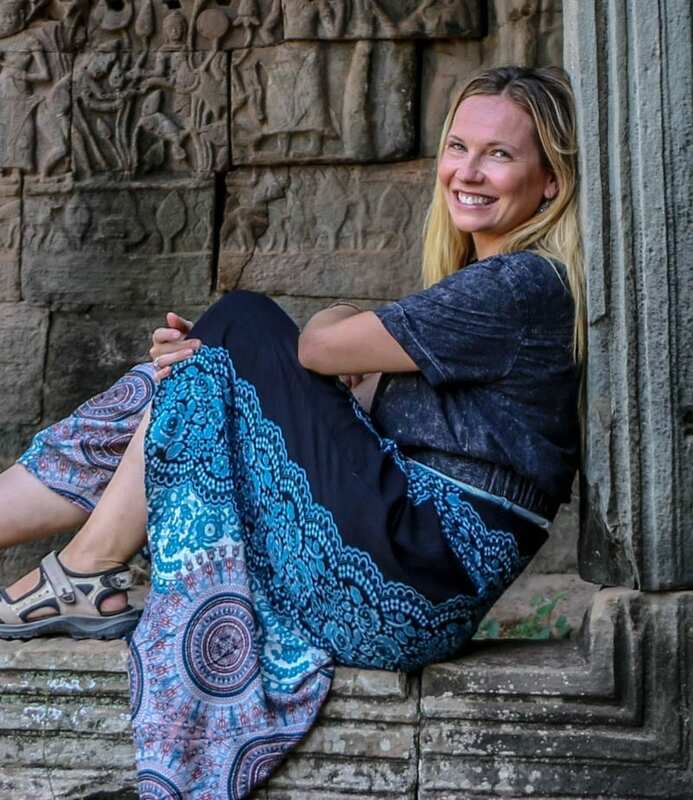 Jen, Thank you for sharing your adventure! This is so beautifully written and with the pictures, it makes me feel like I took the trip to tour Salzburg as well! My 6yr old daughter and I have been watching the Sound if Music a lot and it is cool to see the town it was born in! Thanks for following along, Gia! It was unplanned and perfect. But, if you want to plan it a bit more than I did, Robert would love to take you out and about if he’s available!